Are Journalists the Enemy of the People? It’s just a few words, “enemy of the people,” but they have sent liberal journalists collectively flailing to their fainting couches. “President Donald Trump has declared journalists enemies of the people,” they scream, “this puts us in physical danger and threatens our democracy!” Of course, none of that is accurate, but does that make them enemies of the people or just liberal hacks? Does it matter? Let me just say at the outset that I don’t believe journalists are enemies of the people. I think most of them are frauds – political activists crusading for progressive causes behind the mask of a press credential – but not enemies. That said, they certainly aren’t friends or allies of the people either. Journalists care about journalists, first and foremost, and almost exclusively. As I write in my book, outside of Hollywood, few professions shower their members with more awards and honors than journalism. If you are a journalist and don’t have a wall full of Lucite blocks and plaques with your name carved into them after 5 years on the job…you’re probably a conservative. That self-love (Hell, somebody has to love them) is manifesting itself in their outrage over the president’s words. But only some of the president’s words. Donald Trump doesn’t call all journalists “enemies of the people,” he says “fake news” is the enemy of the people. That so many journalists, particularly from CNN and MSNBC, hear “fake news” and think of themselves is telling. Of course, everything is about them to these people. They are bastions of truth fighting to protect our democracy from the tyranny of Trump. They’re heroes, just ask them. None of that is accurate. They’re just people with jobs. Some of them are good at their jobs, most are not. None are crucial and all could easily be replaced. But not one of them will admit that fact. Their view of themselves is like a circus mirror that not only makes them attractive, it adds a cape. They are heroes in their own stories, writing their own press releases. Their jobs, after all, are mentioned in the First Amendment. They have no such interest in the rest of the First Amendment, or the Second…or the rest of the document. While they throw out their shoulders patting themselves on the backs for being “champions of the First Amendment,” they seek to silence voices they don’t like. Look, I’m no fan of Alex Jones. I’m not a fan of conspiracy theories and crazy ideas of “false flag” operations and attacking grieving families. That said, if you can look past that, or you buy into that sort of stuff, knock yourself out. Jones exists because he has an audience who wants to hear him, no one is forced to listen. People love the Big Bang Theory, but it’s not my cup of tea. I don’t want the show canceled, I just don’t watch it. But liberals can’t handle that contrary opinions exist, they want them silenced; destroyed. CNN had essentially campaigned to get Jones banned from Facebook. On Monday, they succeeded. 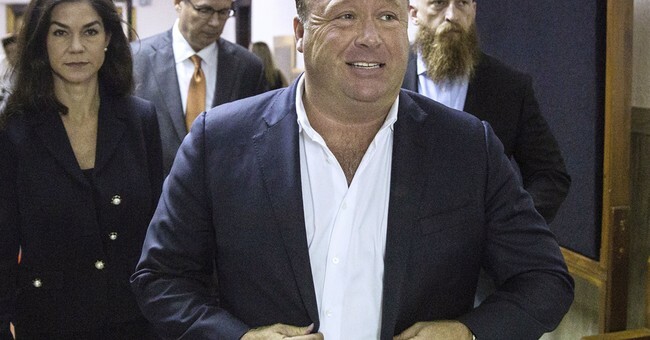 These heroes of free speech got Jones and his InfoWars kicked off Facebook, YouTube, Apple apps, and Spotify. While this isn’t a First Amendment issue since these are private companies and not government, it is a free speech issue. Journalists worked to silence someone else’s speech and celebrated it when it happened. Compare that to how they’ve treated the idea of NFL owners attempting to make standing for the national anthem a rule. In that case, liberal journalists whined about the player’s First Amendment rights being somehow infringed. The hypocrisy runs deep. What was weird about the de-platforming of Jones was how it all came together on the same day. That these mega-companies all decided at the same time to shut him down while being cheered by journalists is more disconcerting than anything he’s said because the implications are much greater. The left would like nothing more than to shut down Fox News, that is their ultimate goal. They’re content, for now, to try to pick off individual hosts – an attack on Laura Ingraham here, an assault on Sean Hannity there – but de-platforming the entire network is their endgame. So even if you’re like me and not a particular fan of Jones, know this is not where this push ends, it’s where it begins. That gets a hard pass from me. The liberal media hasn’t let the facts stand in the way of a good story since Donald Trump rode down that escalator to announce his presidential run in June 2015, so why would they start now? Do you call that an “enemy of the people”? I don’t know, but you sure don’t call it a friend. PS: Once again, I want to encourage you to order a copy of my book, “Outrage, INC: How the Liberal Mob Ruined Science, Journalism, and Hollywood.” It explains the why and how of what the left does in ways that haven’t been before, and it does so with a lot of humor. Don’t take my word for it, take the words of Mark Levin, Ann Coulter, David Limbaugh, Dana Loesch, Dan Bongino, Michelle Malkin, Ben Shapiro, Kurt Schlichter, and countless others. Obviously, I have an interest in selling you a copy of the book, but they don’t. Yet they’ve all endorsed it. You’ll love it, trust me. Thanks.